Home » WRIGHT, CHARLES B.
CHARLES BARSTOW WRIGHT, a financier of Philadelphia, Pa. was born, Jan. 8, 1822, at Wysox, Bradford county Pa., where his parents had settled about the year 1814, on their way from Connecticut to the Wyoming valley. Rufus Wright, who was a currier by trade, at the earnest solicitation of Colonel Piollet, formerly a French army trader, stated the first tan yard in Bradford county. About 1824, Rufus Wright moved to Athens, Pa., where his son, Charles, was placed at the Athens academy until he reached the age of fourteen when Rufus moved on his farm in East Smithfield. Charles went with the family but soon became restless, and after two years was engaged by Jesse E. Bullock to go with him to the eastern part of Bradford county. In a village called LeRaysville, Mr. Bullock opened a store for the sale of general merchandise. Charles adaptation to the business soon brought him into prominence, and he became so proficient that at the age of nineteen, he was admitted as a full partner in the general business of the trading post. This engagement continued until the young man had reached the age of twenty-two years, and gained a valuable experience. Charles had long wished for an opportunity to see the West, and in the Spring of 1843, he was employed by C. L. Ward of Towanda to go to Illinois for the officials of the county and look up several thousand acres of land, owned by eastern capitalists in and near Chicago. At that time, Chicago contained 5,000 people and consisted mostly of one and one and a half story wooden houses. Young Wright spent the greater part of three years attending to the interests of eastern men until he finally purchased the remaining interest of his employers, and his management proved very remunerative during the following few years. In the meantime, Mr. Wright had married Miss Cordelia Williams of Erie, Pa., in which city he engaged to live for a year after his marriage. At the expiration of the year, he desired to return to Chicago, but inducements were held out to him which resulted in the establishment of the first banking house in Pennsylvania, west of Pittsburgh, under the name of Williams & Wright. During this successful copartnership, young Wright was made a director in The Philadelphia & Erie Railroad, projected to run from Erie to Philadelphia across the Allegheny mountains. Mr. Wright took an active part in this enterprise, and being the only director west of the mountains, became prominent in the work of pushing the road through, and was thus occupied nine years. The railroad was then leased to The Pennsylvania Railroad and is yet an important connection of the latter system. From that time forward, Mr. Wright devoted most of his time to railroad enterprises. In the Autumn of 1863, he organized the construction of The Warren & Franklin Railroad from near Warren on the Allegheny river and down its banks to Oil City, a distance of about sixty miles. Here he purchased the control of the Oil Creek and two other lateral roads, thereby acquiring entire control of the system of railroads connecting with the oil territory as then developed. The oil carrying business was a very successful one for seven years, whey Mr. Wright sold the control of the business and roads to The Allegheny Valley Railroad. 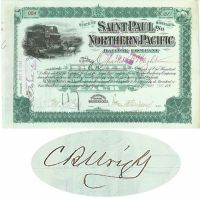 This was in February 1870, and, within ten days after the transfer, Mr. Wright was invited to represent the $5,000,000 syndicate raised by Jay Cooke, the first money that went into the Northern Pacific enterprise. Mr. Wright at the first rejected the proposition, but subsequently accepted the responsibility for one year and finally became interested in the undertaking, after he had paid a visit to the State of Oregon and Washington Territory. Five hundred miles of the Eastern end and 100 miles of the Western end of the line were put under contract and both ends were completed in the Autumn of 1872, and Spring of 1873. In September, 1872, a committee of The Northern Pacific, consisting of William B. Ogden of Chicago, Senator William Windom of Minnesota, Gen. George W. Cass of Pennsylvania, C. B. Wright of Philadelphia, and others, went out to locate a point somewhere on the Pacific coast suitable for a great trans-continental terminus. Extensive powers were given this committee. The trip was made over The Union and The Central Pacific Railroads to San Francisco and thence up the coast by steamer to Puget Sound, where, after an examination of ten days, the head of the Sound on Commencement Bay, where Tacoma is now located, was decided on as the proper point. The committee also visited the Columbia river from its mouth to the head of navigation, about 400 miles, and returned to New York early in November, when General Cass was made president of The Northern Pacific in place of Governor Smith of Vermont, and C. B. Wright assumed the vice presidency. In September 1873, there was no further sale of bonds, and a suspension was the result. Mr. Wright was given charge of the details in the management of the 500 miles of road and several leased lines, until a year later, when the road was placed in the hands of General Cass as receiver, and C. B. Wright was made president. At that time, the floating debt reached the sum of $6,000.000, with a bonded debt of $33,000,000, and prudent and careful management was necessary. Trains were regularly run, payments to employees were promptly made, the line from St. Paul to Bismarck on the Missouri river was put in good order to meet the wants of the public and the various military posts, and the affairs of the company were kept well in hand. In 1874, the plan of reorganization was adopted. In the meantime, the hundred miles of road on the Pacific coast between Tacoma and Kalama on the Columbia river, had been completed. The capital stock of the company had been originally fixed by act of Congress at $100,000,000, but up to 1874, no stock issued. Therefore, in the reorganization the entire capital was kept intact and divided as follows: $48,000,000 of common, and $51,000,000 of preferred stock. This latter stock was issued in exchange for the entire outstanding $33,000,000 bonded debt. Mr. Wright assumed the entire charge of the reorganization and management of the company, including the construction on the Pacific coast and the extinguishment of the $6,000,000 of floating debt. On May 24, 18879, he resigned the presidency of the company and sailed for Europe in search of much needed rest. On his return, in October 1879, he assumed the chairmanship of the Finance Committee of the road. Soon afterwards the syndicate of $40,000,000, was formed by American and European bankers, when active work was begun and continued until the completion of this great enterprise. 1893, Minnesota. Stock certificate issued to and signed on verso by Charles B. Wright. Green/Black. Vignette of a steam locomotive passing a man on horseback. Engraved. Punch and Excellent.